More students who sat the G.C.E. (Ordinary Level) Examination last year qualified to follow the next level – (G.C.E (Advanced Level) – with the number of students who obtained ‘A’s in all nine subjects also showing an increase, while last year a total of 536,152 candidates, both private and school candidates sat the exam. Performances in English and Science too showed an improvement. At last year’s examination 2.23 per cent (6,102) had all ‘A’s in contrast to the previous year’s figures of 2.05 (5,271) per cent. The findings were shown in the analysis of the G.C.E. (Ordinary Level) Exam results compiled by the Examinations Department, Commissioner General W.M.N.J. Pushpakumara said. The analysis focused on the school candidates who sat the exam for the first time. Accordingly 69.33 per cent (189,428) who sat for more than five subjects qualified for the A/L’s as against the figure of 69.02 per cent (177,612) at the previous year’s (2014) examination. However the students who failed in all subjects showed a marginal increase from 3.17 per cent (8,147) to 3.18 per cent (8,698). Last year 536,152 candidates, both private and school sat the G.C.E. O/L exam while the number who passed in more than five subjects were 314,635 or 58.68 per cent and the number who qualified for the A/Ls was 203,923 or 64.81 per cent. The Southern Province emerged as the best performing province with 75.21 per cent who sat the exam for the first time qualifying for the A/L’s and only 2.07 failing in all subjects. The province maintained its position from last year. Western Province remained in second place as in the last year with 72.67 per cent qualifying for A/L’s while Sabaragamuwa Province improved pushing down the North Western Province one place. Uva Province which was in eighth place improved its position by one place over Eastern Province while the Northern Province remained in the last place – similar to last year’s performance. In the North 60.38 per cent qualified for the A/L’s as against 64.19 in the previous year. Districtwise Colombo District performed best with 76.08 per cent qualifying for the A/L’s followed by Matara, Hambantota, Galle, Kegalle and Kurunegala Districts. 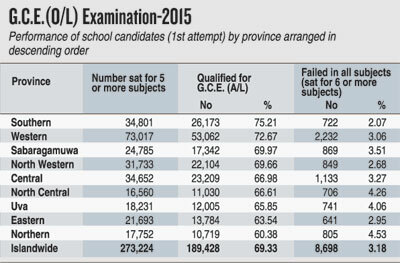 The lowest percentage of students who qualified for the A/L’s was from Kilinochchi District while Moneragala, Jaffna, Nuwara Eliya, Trincomalee and Mullaitivu Districts were among the districts where the percentage which qualified was low. The Exam’s chief said this year the Government had released the results ahead of schedule. He said some 12 million papers had been corrected by some 80,000 teachers. He said this year there were no issues of papers leaking in advance with improved security measures being in place. The ban on tuition classes too helped to reduce rumours that questions had been leaked. He said the same steps will be implemented at future exams.